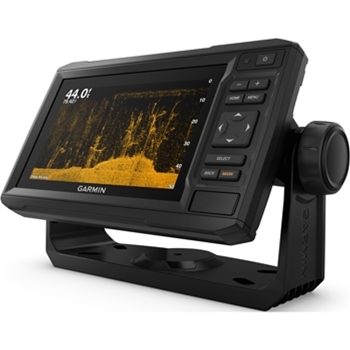 Garmin’s ECHOMAP Plus 63cv with LakeVu G3 Charts provides detailed inland lake charting paired with a Transom Mount transducer for the best in underwater images. Built-In WiFi, large 6” display, 5Hz GPS Antenna, QuickDraw and CHIRP ClearVu are just the beginning of this combination GPS/Fishfinder! A bright Sunlight viewable 6" Display and detailed preloaded LakeVu G3 Charts. The ECHOMAP Plus 63cv from Garmin includes over 17,000+ total lakes 13,000 of those with 1' contours, a single microSD card slot for added mapping, a 5Hz GPS receiver, built-In WiFi and Quickdraw - making this a top contender in stand alone, compact GPS/Fishfinder units. Packaged with a GT20-TM transducer, the 63cv provides traditional CHIRP sonar for amazingly clear target separation and CHIRP ClearVu for crisp, clear near photolike images below your boat. View fish and structure in exceptional clarity. The 63cv also provides traditional sonar support for Minn Kota and MotorGuide Trolling Motors with integrated transducers. Plus, the GT20 enables the mariner access to Quickdraw contours - a mapping software that instantly creates personalized fishing maps on your display with 1' contours that you can share within the Quickdraw community or keep for yourself - whatever you choose! It doesn't stop there though, the ECHO MAP Plus 63 has built-in Wifi and pairs with the free ActiveCaptain app which gives access to OneChart for purchase and downloads of new charts and also access to smart notifications for marina and other point of interest details. Simplified Connections the ECHOMAP Plus with Quick Release mount allows for simple installation and removal since all cables plug directly into the mount. No more messing with multiple cables, when you're ready to remove your unit after a day of fishing just pop out of the mount and your on your way. Wanting to add engine data or control your compatible Fusion device? With NMEA2000 compatibility the 63cv allows for FUSION-Link audio system control, sensors and engine data with simple plug and play connections. All of this at an affordable price point seems too good to be true, but it is a reality with the echoMAP Plus 63cv. Get yours today and get out on the water and start exploring! CHIRP Sonar for crisp clear underwater images! Garmin adapter cable connects a Garmin 8-pin single/dual beam transducer to a Garmin 4-pin echo, echoMAP, echoMAP CHIRP or STRIKER™ series fishfinder. Garmin Protective Cover for echoMap Plus 62cv, 63cv, 64cv and 65cv units. Garmin's Portable Fishing Kit makes it easy to take your compatible STRIKER, echoMAP and echoMAP CHIRP along with you. Packaged with a Portable Carry Case, Handle and Base, Battery and Smart Charger and Transducer Suction Cup Mount and Float. Flush Mount kit for Garmin echoMAP Plus 62cv, 63cv, 64cv and 65cv. Garmin Tilt/Swivel mount with Quick Release Cradle for echoMAP Plus 62cv, 63cv, 64cv and 65cv. 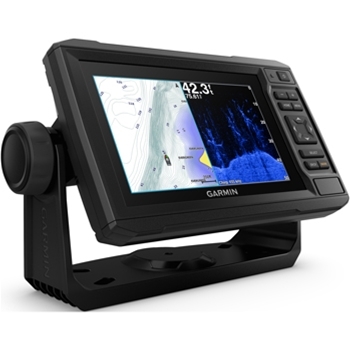 Garmin’s ECHOMAP Plus 64cv provides a large 6” display with detailed Bluechart G2 Maps for the Coastal U.S. Built-In WiFi, 5Hz GPS Antenna, QuickDraw and CHIRP ClearVu make this a top choice GPS/Fishfinder! Garmin's ECHOMAP Plus 43cv with LakeVu G3 charting for Inland Lakes is packaged with a Transom Mount transducer for the best in underwater images. 5Hz GPS Antenna, QuickDraw and CHIRP ClearVu are all part of this affordable 4” combo unit. Large 7” Combination, keyed-assist touch screen. The ECHOMAP Plus 73cv is packaged with a Transom Mount Transducer which provides CHIRP ClearVu Sonar. The 73cv comes preloaded with LakeVu G3 Charts, WiFi, Quickdraw contours and more!